Despite of announcing the opposite, builds of OpenMPT 1.28.02.00 for Windows XP / Vista still did not work on CPUs without SSE2 support. Old CPUs without SSE2 are now fully supported again. In MPTM, OPL notes can now be controlled (volume / pan / pitch) after they have been released. Note Cut (^^^) now really cuts OPL notes, use === to release them instead. For existing MPTM files, the legacy behaviour is used. When initializing an OPL instrument, the undo state of the sample slot was not updated. MO3: Import IT row highlights as written by MO3 2.4.1.2 or newer. 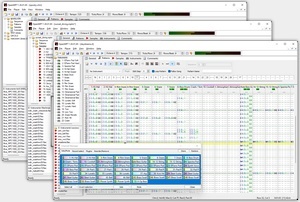 Properly import MIDI program and bank info. On Wine on Linux, prefer DirectSound over WaveOut because there are still systems with winealsa.drv where WaveOut occasionally breaks. This change only affects new installations of OpenMPT. MIDI Export: Pitch bend was not reset when two instruments shared a MIDI channel. Possible crash when doing a portamento from an OPL instrument to an empty instrument note map slot. libopenmpt has also been updated with the same playback and security fixes.